Time flies and it’s time for the UFC’s ‘rookie of the year’ Conor McGregor to get back to thumping heads. "Back on the heavy bag 13 weeks post ACL. Someone will pay. The clock is ticking," tweeted McGregor today with an accompanying video showing off his recovery from tearing the much needed ligament in his August bout with Max Holloway. The 14-2 fighting Irishman known as ‘The Notorious’ shook up the UFC’s featherweight ranks by making an atomic bomb splash with back-to-back wins in 2013. It all kicked off in April at UFC on Fuel TV: Mousasi vs. Latifi where McGregor scored a Knockout of the Night bonus on Marcus Brimage in just over a minute’s work. Just 4 months later, ‘The Notorious’ entered the TD Garden in Boston to a hero’s ovation and proceeded to outclass Holloway to a unanimous decision. Adrenaline is a helluva drug, McGregor tore his ACL during the fight and he still powered through to an impressive victory. Now, ‘The Notorious’ is mad and making videos of himself beating up defenseless heavy bags while seemingly imagining the faces of top 10 featherweights. 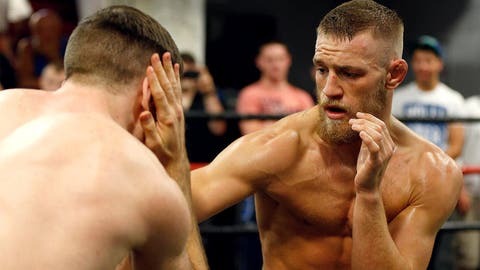 UFC president Dana White has already hinted at the Octagon’s return to Ireland in 2014 and no doubt McGregor is gunning to be healthy to put on another exciting performance for his people.